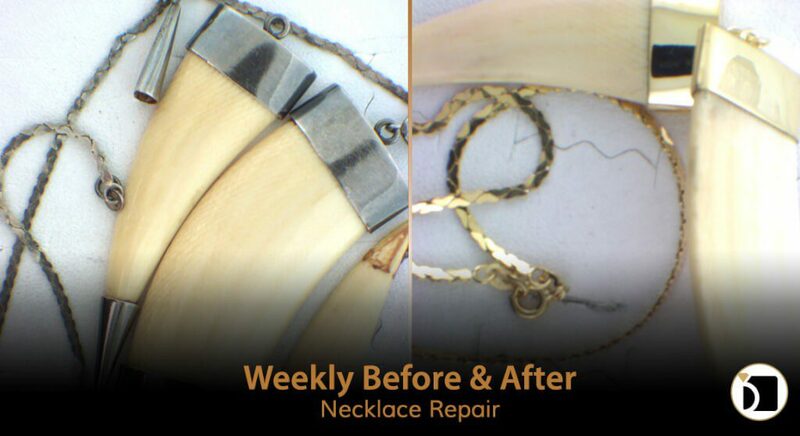 On this edition of the Weekly Before & After, we have a bone and silver tone necklace in need of repair with some of the pieces detached. The client also wanted to convert the metal pieces of the necklace from silver tone to gold tone. For this repair we had to remove and disassemble the pieces from the setting, polish and gold plate the metal, and reset everything. This was followed by gold plating the silver chain, and reconnecting all of the pieces. The end result is a new life for this unique necklace.